Halloween is just around the corner. For some (present company included) this means dressing up and enjoying a bonfire in the driveway with neighbors while passing out candy. For others it means turning off the porch light and going to bed early. And for the most disciplined among us, it means teaching the night away, just like every other evening! Whatever your plans may be, let’s take a minute to dress up in our marketer costumes and think about this holiday like creative business owners. In a couple weeks we may have dozens (or even hundreds!) of kids knocking on our doors in a single evening. Hmm. Seems like a good opportunity to do a little studio promo! I tend to overthink my promotional activities (and most other things! ), but in the spirit of getting things DONE, here’s what we need to do. I bought my candy from the bulk candy section of a local grocery store, but in years past I’ve ordered it from Amazon. I’ve got lots of punny messages you can steal to delight your trick or treaters and promote music lessons in your studio. I used a business card template in Microsoft Word to print my sample tags, but you could also design them using an online app like Canva. I used regular craft cardstock because it’s what I had on hand, but if you’re not into the idea of cutting apart dozens of tiny cards, you can order perforated business card stock or stickers and print the tags that way. In the pics, I only show one side of the card, but you can splash a logo or more contact info on the back. Here are some fun (and some totally dorky) messages to print on tags to promote our studios when we hand out candy this Halloween. 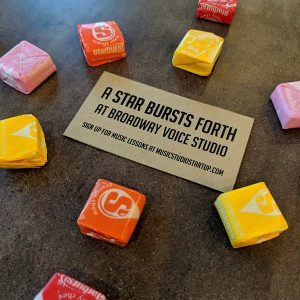 Starbursts – A STAR BURSTS forth at Broadway Voice Studio. 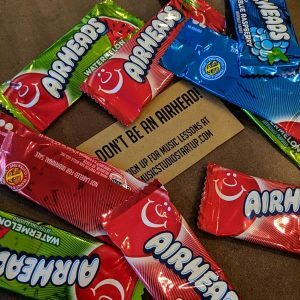 Air Heads – Don’t be an AIR HEAD – learn to play music! 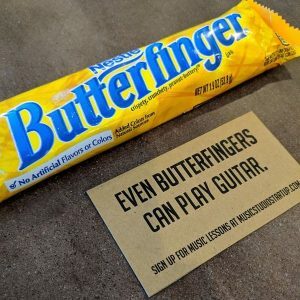 Butterfingers – Even BUTTERFINGERS can play guitar. 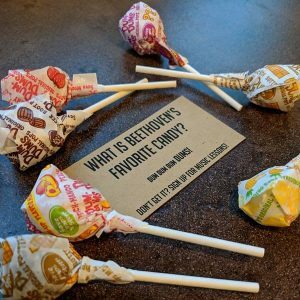 Dum Dums – What is Beethoven’s favorite candy? DUM DUM DUM DUMS! 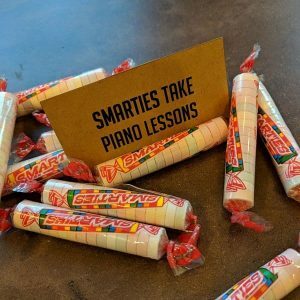 Smarties – SMARTIES take piano lessons. Pop Rocks – Lessons ROCK at Miss M’s Music Studio! Cookie – SMART COOKIES take piano lessons! 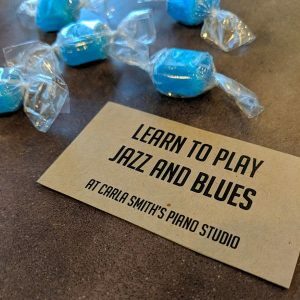 Fun Dip – DIP into music lessons this fall! They’re FUN! Pixy Stix – Grab your STIX and learn to drum with Kaylee! Reese’s Pieces/Peanut Butter Cups – Peanut butter and chocolate go together like you and the piano. Spiders – Don’t let your brain fill with cobwebs! Learn to play the piano. Play-Doh – Say “no” to mushy brains. Lean to play the guitar! Brains Erasers – Music makes your brain smart. Take piano lessons! Bouncy Balls – Have a BALL in music lessons! Squishy Eye Balls – Keep an EYE out for a new music studio opening in January! Teaching right through Halloween this year? Put a friendly sign on the door saying there are music lessons happening and trick-or-treaters can help themselves to a piece of candy from the bowl. Are you do anything to promote your studio this Halloween?